Y.S. Jaganmohan Reddy yesterday launched YSR Congress party flag. YSR wife YS Vijayalaxmi was also there who hoisted the flag today at YSR ghat at Pulivendula of Kadapa district. This flag is tricolor and has YSR photo in middle. 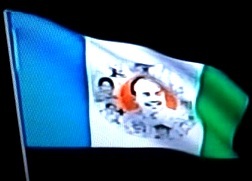 It has blue, white and green vertical strips in the flag launched yesterday of YSR Congress party. In centre, apart from YSR photo the other things represents the welfare schemes launched by late chief minister Y.S. Rajasekhara Reddy. Many supporters, Congress MP and many other dignitories were present at the flag hoisting ceremony that took place a day back. All three colors white, blue and green that has been used in this flag also symbolizes different meanings. superb & pentastic..best of luck for future..i wish all the success..to ..our YSR PARTY..
the establishment of YSR Congress party will clean up CONGRESS,TDP AND any other political dramatist in soon.congress party will sweep over ANDRAPRADESH in ahed election.i express above words from my deep heart behalf of those who got benfits during the rulling of Y.S RAJASEKARAREDDY.